The World’s First Bridal Shower! Home Bollywood The World’s First Bridal Shower! There are quite a few traditions most brides and grooms know about – exchanging the rings, throwing the rice, throwing the bouquet, etc. – but may not know how they got started. Throwing rice – to shower the newly weds with fertility! So to satisfy all those inquiring minds, we wanted to start a discussion around some of the events and traditions you may see at South Asian weddings. First of all, wedding functions (which can be 3-6) differ from different regions and cultures within South Asia, as well as different religions. At each of the functions, there are different traditions followed. In addition, its not just the brides and grooms getting married, but their whole families are involved in the process. 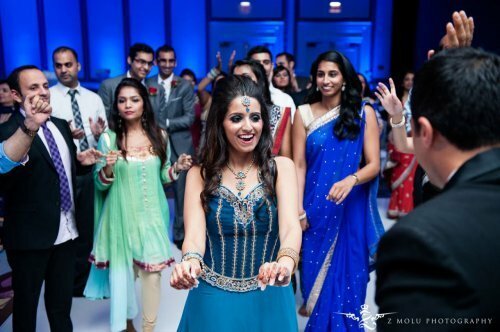 A couple of our favorite pre-wedding functions (common to most South Asian cultures) are the Mehendi and Sangeet events. Depending on the culture and budget, they may even be combined. In this post, we will focus on just this function, and continue the series in other posts. Mehendi or the paste from Henna leaves (and mehndi tattoos) has been made popular by music artists like Beyonce’, Gwen Stefani and Madonna, but its origin is thousands of years old – dating back to the 15th century, when the Mughal rules brought the mehndi plants to India. First a turmeric paste (called Haldi) is applied to the bride’s face, hands and feet and then the application of Mehndi begins. In most cases, skilled mehndi artists come to the event and apply various designs to the bride and her guests. Sometimes even initials or the name of the groom are hidden in the mehndi design on the bride. A common belief is that if the mehndi color is very deep after washing, the groom loves the bride a lot. In addition, it is also believed that since this would be the last night the bride would spend as part of her birth family, she should spend it having fun with her family and friends. As a recent article put it, the closest analogy to the Mehndi Ceremony in the West is the Bridal Shower – a celebration of sisterhood for the bride. From that perspective, the Mehndi ceremony can be called World’s First bridal Shower!